The last couple of months have been busy for Historic New England’s property care team in Rhode Island. At Casey Farm in Saunderstown, the team repaired a stone wall along Boston Neck Road damaged by a car and a mobile chicken coop that suffered from the effects of Hurricane Sandy. 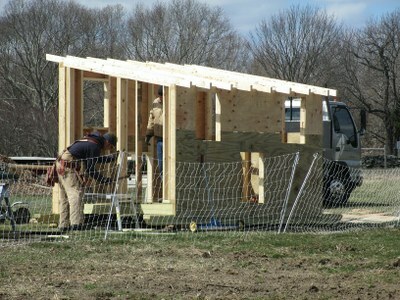 Casey Farm also received a new coop for its turkeys and a vent stack for the greenhouse boiler. Across Narragansett Bay at Watson Farm, repairs were made to damage sustained by the farmhouse and visitor shed when the February blizzard Nemo felled trees in the farm yard. Meanwhile, our own carpentry crew has been visiting our historic properties for spring tune-ups. Most notably, Croade Tavern at the Arnold House property in Lincoln received repairs designed to combat continued basement flooding. Clapboards were removed on the north elevation of Clemence-Irons House in Johnston so that the sill could be examined to pinpoint the extent of deterioration. The Watson farmhouse received a new gutter. The Casey Farm exit gate was reinforced because it was sagging beneath its own weight. The team removed shelving from the office/bunk house to facilitate its future use as a rainy-day education space. Every day our work involves preservation of the properties, from implementing projects to planning for future work or responding to emergencies. If you value the work we do to preserve New England’s built environment, please consider supporting us with a gift to the Preservation Maintenance Fund.